What are the skills and attitudes for successful public problem solving? 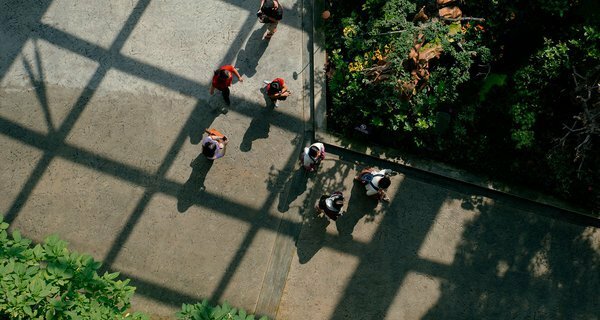 We introduce our new competency framework on the key skills, attitudes and behaviours that public sector innovators combine. Kelly is a Learning Experience Designer in the Innovation Skills team. 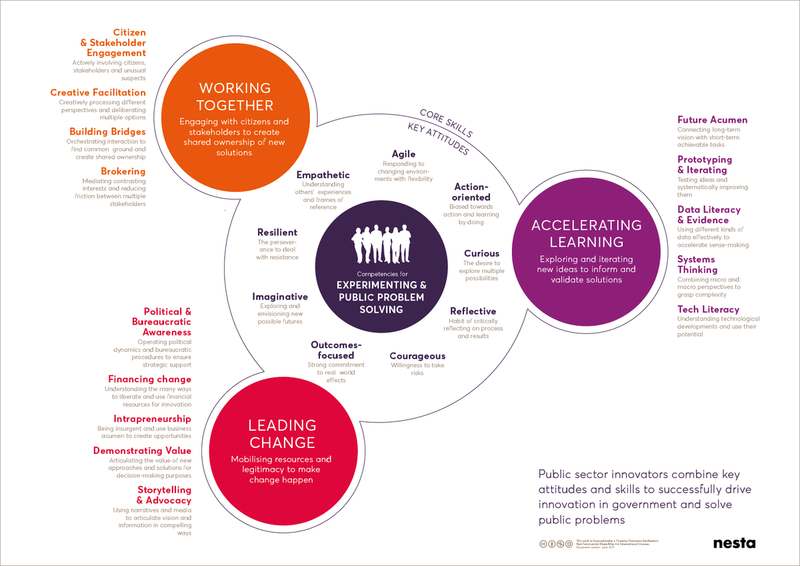 Nesta is currently working with leading innovation practitioners from around the world to define the key skills, attitudes and behaviours that public sector innovators combine in order to successfully solve public problems. In this blog we introduce a new competency framework that we are creating, and describe our plans for developing it further. Finding the space and time to invest in the future while being responsible for delivering services that people rely on today is a well-known dilemma for governments around the world. While we’ve seen an increasing number of interesting project pilots and inspiring innovation labs and teams, the larger-scale impact that could come from applying these promising new approaches strategically in government rarely happens. Governments are still struggling to embed innovation in their organisations and existing operational processes. The big question is how we go beyond individual pilots, projects and labs? How best to apply and spread the approaches, skills and culture that increase the ability of governments to innovate? What will strengthen the innovation capacity of governments and enable a better use of innovation resources in order to deal more effectively with public problems? Human resources as an enabler for public sector innovation? One significant part of answering these questions lies within the domain of human resources (HR), and the relationship between public workforce skills and innovation. We see that governments are increasingly using competency management approaches to set up standards for professional behaviour and performance management, as well as to gain competitive advantage by integrating HR policies with business strategies. But, beyond the broader and more established employee characteristics and behaviours for innovative working - such as motivation, openness to ideas, and change management - less is known about the unique attitudes, skills and competencies needed to support public sector innovation. How do they differ from, relate to or build on current core competencies of public officials? And, not least, how do public organisations succeed in practically implementing them in their core operations? To support this effort, there have been recent attempts to provide more clarity on the core competencies of public sector innovation – such as the OECD’s Core Skills for Public Sector Innovation, or Le Nuancier de Formation from La 27e Region. While it’s helpful to gain more clarity on what characterises innovative activity, we also need to focus on what it actually takes to create impact from innovation approaches specifically in government settings. We believe that problem solving is at the heart of how governments operate, and so we need to demystify how innovation approaches can be useful and what the relevant skills and competencies are in relation to core problem solving activities. This is core to our work on developing a new competency framework for experimental problem solving. By framing our competencies around experimental problem solving, we try to emphasise how core attitudes and characteristics, in combination with key skills and competencies, enable behaviours that increase the likelihood of successful problem solving activities and better improve capacity. We also want to go beyond creative thinking techniques and brainstorming – which are useful for generating ideas – and highlight the competencies that are needed to systematically create, authorise, test and improve on ideas. Firstly, we have used the experience of the Nesta Innovation Skills team (who have worked in and with multiple pioneering government innovation labs and teams for a considerable amount of years) as a starting point. Secondly, we used our insights from recent research on the experiences of 30+ leading public sector innovation practitioners from around the world. Thirdly, we have tested our research insights with selected governments and innovation experts to ensure accurate representation, relevance and usefulness. Fourthly, over the coming months, we will be continuously working with innovation practitioners to co-develop and refine concrete behavioural indicators and assessment criteria. Fifth, and most importantly, we will be working directly with ambitious governments to test and experiment with how the competency framework can be integrated into their innovation learning journey as part of systematic capacity-building activities. The attitudes and skills outlined in the framework are the broader elements that, in combination, drive successful application of experimental problem solving activities. They are crucial for successfully creating impact with established innovation methods, such as human-centred design, behavioural insights, data-science, foresight, etc., which each require a set of more technical skillsets. We’ve found that the effort required to create the space and legitimacy for innovation in government is often significantly underestimated. Good ideas can’t flourish in a hostile environment. So in addition to the skills needed to simply apply innovation methods, our framework focuses on innovation craft. That is, how might we practically and effectively navigate, apply, embed and organise for innovation approaches in government and how to create an enabling environment to make innovation happen and ensure impact. Teams are central to successful problem solving and so we start with the team, rather than the individual, as the unit of action. The framework presents a diverse palette of skills and attitudes that are rarely all found in one individual, but need to be present within the wider innovation team. The challenge (and opportunity) is to combine these skills and attitudes in ways that make the team greater than its individual members. Solving complex problems involves managing the intricate tensions and dynamics between opposing mindsets, skillsets and ways of acting. Such dynamics include: being disruptive and challenging the status quo, while being humble and integrative; making decisions in the face of uncertainty while being able to legitimise these decisions; having a clear plan of action, while adapting to and improvising for unforeseen situations; exploring new possible futures, while focusing on outcomes and committing to real-world effects; keeping the big picture in mind while also considering citizens' needs at an individual level; being reflective and critical while having a strong bias towards action. All this requires ongoing judgement and the ability to combine multiple different attitudes and skills at the same time. For these reasons, it is important to recognise the elements presented in the framework as “complex skills”. Download this diagram as a PDF. Tools for setting (un)learning objectives. We will develop context-sensitive and customisable behaviour indicators to support capacity development and assess the impact of innovation learning. Team and organisational assessment tools. We will generate tools that can help you assess the readiness and capability of your team, organisation and wider ecosystem. Team roles. We will develop a set of innovation team roles to help break down the tasks and functions of an innovation team and support governments in team design and management. Learning support and reflection tools. We will develop a set of practical frames for practitioners to use as systematic reflection for professional development and collective sense making. Rethinking HR strategy. We will apply the framework to explore how to develop more effective HR strategies focused on behaviour change, enabling better performance and recruitment for successful problem solving. All of these will be tested and developed further in practice with ambitious government partners.Growing the innovation skillsets and capabilities of the public workforce requires informing hiring practices, career development and training opportunities. 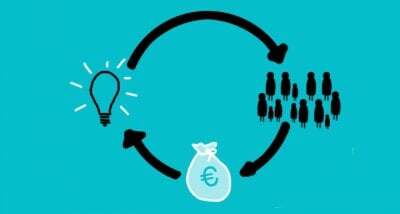 It also requires creating the right incentives, processes and structures for public sector innovation. Governments are often aware of all this, and yet struggle with knowing where to start.This framework is meant to be a first step in supporting these efforts and enabling innovation approaches to become strategic drivers of successful experimental problem solving activities. We welcome your feedback. We are especially keen to engage with governments, organisations and people that are doing interesting work in this area and/or want to explore possibilities for transforming their organisations for the better. Very interesting document that will be very useful for public sector innovation in Bangladesh. Very informative. Looking forward to seeing more documents like this!!! Very good information, could we have PDF version ? Rethinking Parks supported 11 pioneering parks innovators to test new business models that would enable the UK’s public parks to thrive for the next century.